A watari, a Japanese go term, is a connection between stones by bridging underneath the opponent's stones at or near the edge of the board (usually on the first or second line, but also as high as the third line). White cannot play at a. 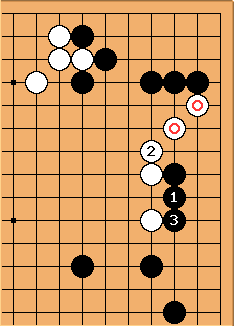 For Black stones, move is watari, which connects the initially semi-isolated black stones with the group on the left. This version on the first line is sometimes called Binbo (poor man's) Watari. After connects to White's stones, then is watari. Gokyo Shumyo Tsumego Series contains 74 Connect Underneath problems.